With 100 per cent of graduates employed in a professional or managerial role six months after graduation, the connections we provide are meaningful and will have a direct impact on your employability. "I was apprehensive about joining a professional consultancy at first, and uncertain of my abilities. However, since joining I have designed steel beams, ground beams, pile caps, reinforced concrete beams, carried out load take-downs and derived the wind loading for a £40 million circular (in plan) 23-storey building, as well as managing to structurally model the effect of the stepped columns for the building, each floor is twisted through a rotation. I have just completed a model of this structure in ETABS to check its stability and to derive the loadings on the shear core. Most of the new graduates here are not doing anything this advanced, which leads me to the conclusion that my senior engineer must be impressed with my work and approach, especially as he was the one that advocated my access to ETABS." "Working as a non-graduate land surveyor in the New Forest in my 20s, I couldn’t help but notice that, all too often, I was training graduates who would eventually out-rank me. 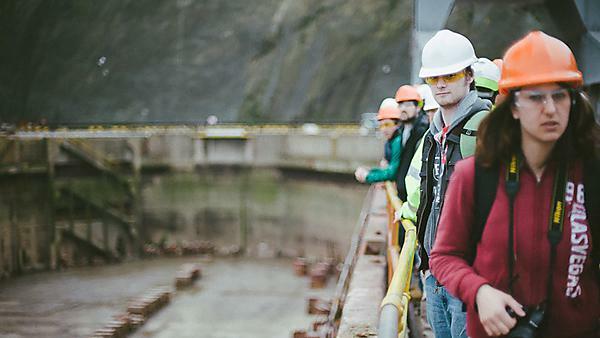 It was time for action and I made the decision to study to be a civil engineer at Plymouth. After a very intense but fulfilling few years, the reward was a 1st class MEng (Hons) in Civil and Coastal Engineering. The bonus was the Smeatonian Society of Civil Engineers’ Eddystone Lighthouse 250th Anniversary Commemorative Medal, plus the Head of School and ICE awards. During holidays and spare time I was fortunate to gain work experience at Jubb Consulting Engineers and then at Hyder Consulting, who were to become my full-time employers."